Artistic freedom is a beautiful thing. Of course it has its risks. The freedom when adapting or basing new work on established material has challenges of its own. It's quite fitting that the work that Nancy Harrow chooses to write her musical is about artists. 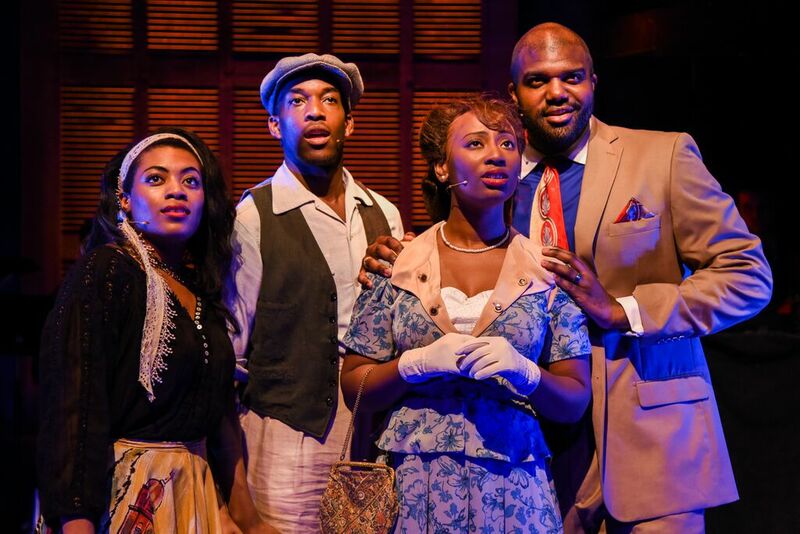 Inspired by Nathaniel Hawthorne's “The Marble Faun”, For the Last Time takes the quartet of Hawthorne's gothic novel and transports them to New Orleans in a race-bending jazz musical. Billed as a new jazz musical with a score that evokes generations of the genre, For the Last Time takes four artists, a writer, a painter, a musician, and a jazz club owner, as they are haunted by love and their pasts. The risks of artistic freedom Harrow encountered were plentiful. Nancy Harrow has a strong sense of musicality but her storytelling is severely lacking. The book is weak and beyond repair. Adapting Nathaniel Hawthorne's "The Marble Faun" requires precision, something that wasn't present. The characters were thin, lost in a dense plot that missed a lot. Harrow and cowriter and director Will Pomerantz skimmed over exposition, causing troubles later on. The plot related problems of the source material are not only highlighted in For the Last Time, but they are even more pronounced. Arbitrarily picking 1950s New Orleans seems more like a desire for the musical style as opposed to a direct link to Hawthorne's piece. While New Orleans is certainly an artists' haven, it just sadly missed the connection. With some sever dramaturgical questions regarding the missing pieces from “The Marble Faun”, there’s only so much Harrow’s score can save. Despite the problems of the libretto, the score Harrow has composed is quite beautiful. For the most part, her songs resonate well for her company, evoking a strong sense of style. The score is infectious and fun. But "Lowest of the Low", a song filled with so much necessary plot gets sucked away by the music. The content wanted to remain as dialogue. But the music can only carry a musical so far. By the middle of Act II, little dialogue existed, launching from song to song feeling more like a song cycle. The ensemble did a sinfully good job interpreting Harrow’s music. But they too, seemed lost in the lack of dramatic content. Britton Smith and Brittany Campbell were the standouts of the bunch. Smith is stellar as Donatello, proving himself capable and a hopeful household name of the future. Campbell as Miriam has a stunning voice that made up for her harried character. Silky smooth toned Carl Clemons-Hopkins and sweet voiced Anita Welch as Kenyon and Hilda respectively surely got the short end of the character arc stick but both proved their talents through song. Doubling Reggie D. White as Overseer the narrator, and Teacher, an unclear character from Miriam’s past, was a questionable choice dramaturgically speaking. While White’s presence as both characters was wonderful, you’d hope he’d be the Overseer throughout the entire show, a device that Harrow and Pomerantz only touched upon mostly due to White's need to change costumes. The aura of New Orleans pervades the theater as the audience arrives. The scenic design by John McDermott instantly honors the location. For those who know New Orleans, you can't help but get excited. Sadly, the positives end there. Pomerantz's staging, albeit theatrical, did not work well with the beautiful set, making it appear more as a hindrance. Fluidity was clearly important to Pomerantz but the melding of the multiple locations within the architecture was troublesome. There’s nothing more awkward than watching an unsure actor walk through an invisible door that moves location. The height of the second tier, while casting some stunning stage pictures, caused other site line issues. The fantastic orchestra sits in such a prominent position that eliminated upstage center, a location Pomerantz could have used. The colors that lighting designer Jimmy Lawlor brought to the stage evoked the animation of the French Quarter. The color combinations along the giant plantation window were stunning. But with so much action occurring underneath McDermott’s set, there were some unfortunate shadows and dark patches. The costumes by Whitney Locher, for the most part, were perfect. Each character was represented nicely through color or pattern, with the exception of Miriam. Miriam's bold statement skirts are quite flashy and clashed with the black top, sucking the away the vibrancy. It is without question Nancy Harrow and Will Pomerantz took an artistic risk with For the Last Time. You have to commend them for that. But with the troubles of the book overshadowing the positives, For the Last Time sadly falls into the miss column.